Maharaaj Singh was a saintly person turned revolutionary who led an anti-British movement in the Punjab after the First Anglo-Sikh war, was born Nihal Singh at the village of Rabbon, in Ludhiana district. 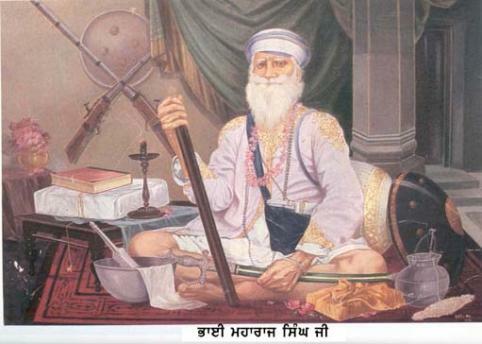 He had a religious bent of mind and came under the influence of Bhai Bir Singh of Naurangabad. After the latter's death in 1844, he succeeded him as head of the Naurafigabad dera and was held in high esteem by a vast following, including most of the Sikh chiefs and courtiers. Maharaj Singh's revolutionary career started with the Prema conspiracy case involving him in a plot to murder the British resident, Henly Lawrence, and other pro-British officers of the Lahore Darbar. Maharaj Singh, whose movements were restricted to Naurangabfid by the British, went underground. The government confiscated his property at Amritsar and announced a reward for his arrest. He escaped to Jammu and made Dev Batala his secret headquarters. In December 1849, he went to Hoshiarpur and visited the Sikh regiments to enlist their support. Bhai Maharaj Singh, who carried on his head a price of 10,000 rupees was arrested on 28 December 1849 at Adampur. The Guru is no ordinary man," wrote Dr Vansittart, the Jalandhar deputy commissioner, who had arrested him. He is to the natives what Jesus is to the most zealous of Christians. His miracles were seen by tens of thousands and are more implicitly believed than those worked by the ancient prophets" Vansittart was so greatly impressed by Bhai Maharaj Singh's personality that he recommended special treatment to be accorded him, but the government did not wish to take any risks and deported him to Singapore where after several years of solitary confinement, he died on 5 July 1856. He had gone blind before the end came.